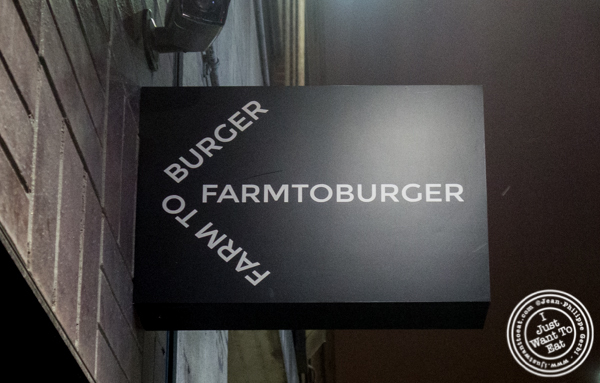 Farm to Burger: what an interesting name at a time where the farm to table restaurants are considered more and more by diners who want quality food and are worried about the effect of processed or unnaturally fed produce. Grass fed, hormone and antibiotic free are more commonly displayed on menus and Farm to Burger prides itself on offering its patrons quality ingredients that are locally sourced. Opened in December 2018 in the Aliz hotel next to Port Authority Bus Terminal, it is a bit hidden. I admit that I thought it was a small place, maybe like Burger Joint in the Parker Méridien, but it is not: this 90 seater is big with a decor supposed to represent a farmhouse. As it’s name indicates, it is all about burgers, but you can get chicken (they offer a spicy fried chicken sandwich), fish (to be honest I would never consider it) and a veggie burger made with the up and coming Inpossible Burger, a good idea for vegetarians who like the taste of meat, if it was probably well executed and not overcooked like the one we tried, making it a bit dry. For meat lovers, they have a hot dog that is supposedly quite good as well as few burgers like the classic, made with a beef patty, a thick slice of bacon, cheddar, lettuce and tomato. The meat, cooked medium (pink in the center), was good and juicy, but the proportion meat / bread was unbalanced in favor of the latter that was not so soft. Too bad. They would have a better bread and a thicker patty, it would be a good burger.